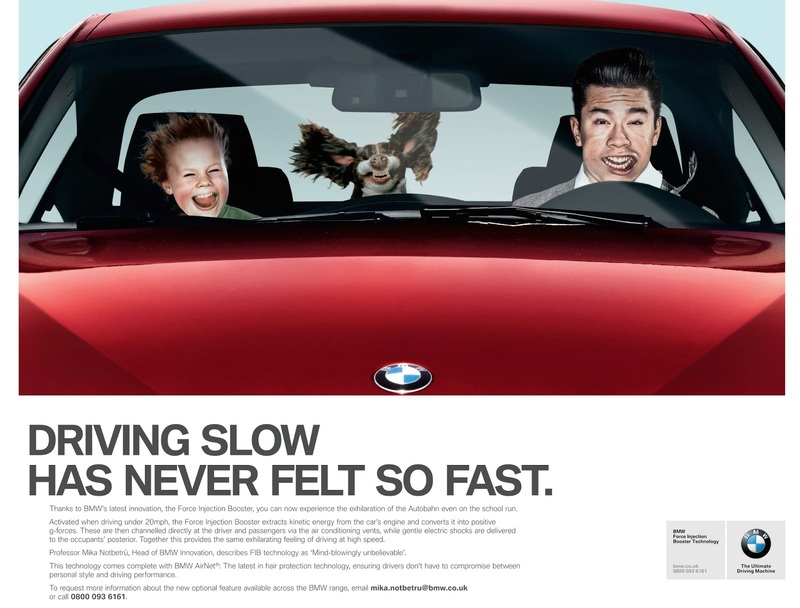 The BMW April Fools 2014 ad is here! For many years BMW have run BMW April Fools ads in the UK and this year the BMW April Fools ad is the 'Force Injection Booster' meaning 'Driving Slow Has Never Felt So Fast'! "Thanks to BMW's latest innovation, the Force Injection Booster, you can now experience the exhilaration of the Autobahn even on the school run. Activated when driving under 20mph, the Force Injection Booster extracts kinetic energy from the car's engine and converts it into positive g-forces. These are then channelled directly at the driver and passengers via the air conditioning vents, while gentle electric shocks are delivered to the occupants' posterior. Together this provides the same exhilarating feeling of driving at high speed. This technology comes complete with BMW AirNet: the latest in hair protection technology, ensuring drivers don't have to compromise between personal style and driving performance. To request more information about the new optional feature available across the BMW range, email mika.notbetru@bmw.co.uk or call 0800 093 6161."